It seems intuitive that music which sounds soothing to us, would also have the same effect on our animals. But is that true? 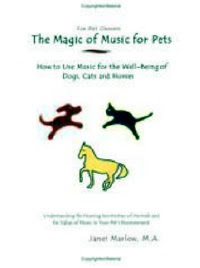 Well, yes and no, according to Janet Marlow's short primer, The Magic of Music for Pets: How to Use Music for the Well-Being of Dogs, Cats and Horses. Janet is an internationally known composer, with a special expertise in designing acoustically appropriate environments for dogs, cats, and horses. As she explains in The Magic of Music for Pets, "music for human listening does not guarantee behavioral calm and a soothing environment for animals." This is true, in part, because dogs, cats, and horses (the animals most thoroughly studied by Ms. Marlow) are capable of hearing different frequencies than we are, and are most comfortable when sounds are within their optimal hearing ranges. Horses have a hearing range between 55 and 33,500 Hertz (Hz), which is similar to ours, while dogs (67 to 45,000 Hz) and cats (45 to 64,000 Hz) are capable of hearing sounds that are considerably higher. So how can our knowledge of our animals' sound sensitivities help us to design music that will enhance their lives? It's here where Janet really excels, describing the process she used to create her CD series, Relaxation Music for My Pet and Me, and Relaxation Music for Horses: "When composing, I place the music in the register or octave range best suited to the animal. The final stage of the production is to digitally position the frequency range of the music directly in the middle of their hearing comfort zone to avoid any extremes that would cause an animal stress or make them flee from their resting place." Based on my own observations of my Springer Spaniel, Tish, I can attest that Janet's techniques worked amazingly well in Relaxation Music for My Pet and Me (Volume 3). Within a few moments of my turning it on, Tish gravitated to the room where it was playing, and was soon fast asleep! to rest. . .Rescued dogs at the kennel diminished their anxious barking. and the staff commented to me that it helped them feel calm as well." Similar effects were noticed when Janet played her Relaxation Music for Horses compositions at local stables. I found it fascinating that she modeled her equine music not on classical motifs but on country music, based on anecdotal reports from horse people who had noticed that their horses seemed to enjoy listening to Country Music stations when the radio was on in the barn. 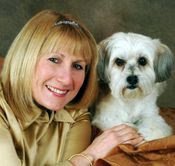 Because the music in Janet Marlow's Relaxation series for animals has been composed and recorded with such care and awareness, it can be profoundly useful in easing the stress of separation anxiety, for example, or during thunderstorms, or for animals who fear getting into cars or trailers. These sensitively created CDs are a gift of peace for both animals and their people. 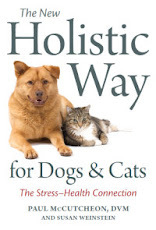 The next "Conversations with Animal Authors" teleconference will feature author and composer Janet Marlow, who will discuss her books, The Magic of Music for Pets: How to Use Music for the Well-Being of Dogs, Cats and Horses, and Zen Dog, during a free hour-long event on Tuesday, July 28th, 2009 at 8:00pm (EDT). Ms. Marlow is an internationally renowned composer, author, and authority on acoustic environments for dogs, cats, and horses. A recognized expert in the field of pet relaxation, she has appeared frequently on Animal Planet. She has studied the effects that jarring volumes and frequencies have on animals' mental, emotioal, and social behavior, ad has documented her results. Her series of CDs, Relaxation Music for My Pet and Me and Relaxation Music for Horses, have sold worldwide. If you would like to learn more about how animals experience sound and how you can use music to enhance the quality of their lives and ease stress, you can join the "Conversations with Animal Authors" call by dialing 616-347-8100 on Tuesday, July 28th at 8:00pm, and entering PIN #1063739. Long-distance charges may apply. I'll be posting a recording of the teleconference on this site, for those who can't participate live. On a cold day in early April, 2003, I drove to Westchester Medical Center in New York to visit my sister, Janice, who was dying of liver failure. I didn't know that then, but I understood that she was gravely ill. Janice didn't have much of an appetite, and her memory was failing, and I can't remember everything we talked about during the last hours I spent at her bedside. But one memory will never fade from my mind. It was when two smiling therapy dogs came into the room to bring some comfort to my sister. For those fleeting moments, Janice smiled and seemed to come out of her fog, even laughing with delight as one of the dogs jumped right up in bed with her, audaciously licking her face. Such is the power of dogs to bring joy into a person's life. And it is stories like these that Sharon Sakson has so eloquently told in her wonderful, life-affirming book, Paws & Effect: The Healing Power of Dogs. Sharon chronicles the way in which dogs can literally save people's lives, whether they are recuperating from debilitating illnesses, suffering from undetected cancer, fighting unseen enemies in wartime combat, living with the ever-present threat of an epileptic seizure, wracked by unrelenting pain, plagued by plunging sugar levels from type II diabetes, or trying to live with dignity and independence while compromised by sight or hearing disabilities. 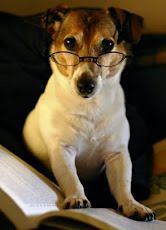 Ms. Sakson has an artful ability to grab her readers by telling them about one particular dog, and how he or she transformed the life of one individual person, all the while providing scrupulously researched sources and documentation to buttress some of the seemingly unbelievable successes of these remarkable canines. Some of her stories are heartwarming, such as the one about "Mr. Gruffyd Babayan," an odd-looking, one-eyed Brussels Griffon who, as part of Westminster Kennel Club's Angel on a Leash program, makes weekly visits to Morgan Stanley Children's Hospital and Ronald McDonald House in Manhattan, in his role as an "Animal-Assisted Therapy Dog" to lend encouragement to children who have cancer, and heart failure and leukemia and broken bones. He's a particular favorite among physical therapists who have trouble getting their young patients to start walking again, after surgery. Mr. G.B. has an uncanny knack of being able to motivate children to get up and try to do what they think they can't do. same would be true for 'Restroom' or 'Park'. . .
and set out to teach her own dogs, Lexus and Keila, to read. 'It was straight classic conditioning,' Bonnie says. She showed Keila the Down' card, and asked her to lie down, and gave her a reward. Within one lesson, whenever she showed the word, Keila lay down. Lesson learned. Keila could read. placed with a person with a disability." And there's growing evidence to show that dogs can actually be taught to recognize an impending seizure because the affected people give off a powerful smell that is undetectable to the human nose, but easily perceived by canines, who are believed to be able to detect scents 10,000 times better than a person, according to Dr. Jim Walker, head of the Sensory Research Institute at Florida State University. Trainers are now successfully attempting to harness this canine characteristic to educate dogs to detect not only epilepsy, but even ovarian and breast cancer, by sniffing the breath or urine of afflicted patients. 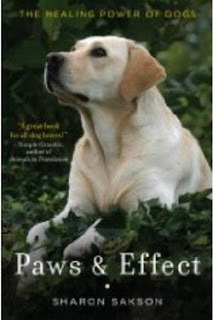 Paws & Effect: The Healing Power of Dogs is a great read if you're a dog lover, but it might be even more compelling if you're a skeptic about what dogs can do. Sharon Sakson has written a magical, inspiring set of stories that left me wishing for more.